Now these are just specials, but they make you want to go back and watch the main series again. You see all the characters again. Break, Gilbert, Oz, Alice, etc. Each special made me laugh and have a nostalgic feeling to go back and see the series again. If you love the main series then I would definitely advice watching them. Since the series also lacks a season 2 a lot of fans craved to see more and this doesn't completely, but fills in some of that craving. There's always the manga if your interested enough to see what happens next. 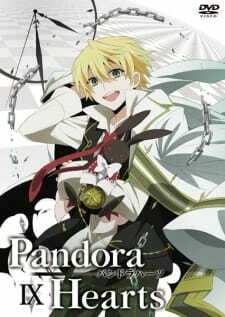 Pandora Heart is a mystery fantasy anime that was aired on the year 2009 where during does days I was a high school boy who really enjoy watching mystery type series and one of them is “Pandora’s Heart”. Set in the world of the middle ages where duke’s and novelties are in power and each novel family carried the a deep secret that holds the truth about the past which our main character Oz Vessalius ,the heir of becoming duke in the family, going to uncover it follow by with his partner alice, with unknown origin, and his royal servant Gilbert Nightray to uncover the truth and discover how alice is related to the dark history the novel families hides. This is what the “anime series” provide to its viewer in the mystery aspect and provides action and fantasy along the way. Sadly the anime was left incomplete and the Season 2 is almost impossible given the years have pass. This is where the special came along just to give additional service in the series. The special doesn’t add up in the storyline but it does make some entertainment to the Pandora heart fans. The special is the complete opposite of the series because it focuses on complete comedy while using the former dramatic soundtrack which reminds to watch the show again. Pandora Heart has a small nostalgia for me but still I won’t be watching it again because I fear I may have a different view now than back when I was a happy go lucky watchers who doesn’t critically analyzes shows. for even Pandora’s Heart Specials is pulling the same gag that other short minute anime special provides. The only reason I didn’t give a rate between 2-3 is because of the nostalgia the soundtrack provides and how I like the characters back then. The art style is the same with the original. I highly recommend this to only to “pandora’s heart fan” that haven’t seen this episodes yet. This special is only good for fan service for the fans of this series. I won’t recommend it to others who haven’t finished the original series. As I stated before the anime is incomplete so the mystery part is still questionable for there are still lots of mysteries unanswered and left you thinking. The anime is more like promoting the manga so if you want a forward story I highly recommend the reading manga for it surely continues what the anime left off and explain it more properly. The sole purpose of this review is to remind the “Pandora’s Heart fans” that there is a spin-off special they should watch and also to encourage the people who haven’t watch the anime yet better off to read the manga since the anime is incomplete.